Applications now being accepted for our Fall 2019 cohort. Space is limited - apply today! The Fall 2019 Cohort runs September-December of 2019. Applications due by August 1, 2019. Emerging Leaders is available to anyone who is an employee of a LeadingAge Maryland non-profit member organization, regardless of their position or work experience. It is more important for candidates to demonstrate potential within their organizations and the field than it is for them to carry a specific job title. Tuition includes the costs of leadership assessments and individualized reports, learning materials, and breakfast and lunch each day of the program. Pay the Emerging Leaders Program tuition and any related costs of travel. Provide a supportive environment in which the participant can begin to practice applying the knowledge and skills gained in each session. Attend and actively participate in each of the course sessions. Complete assignments to enhance the understanding and application of the content areas. Actively participate with your assigned learning group through phone and email. Remain employed with a LeadingAge Maryland member for the duration of the program. "I had a realization that made me glad I was participating: everyone was around the circle in their DiSC order and it occurred to me- although we are so different in leadership styles, I could not do my day to day work without these other minds and personalities." "The most memorable part of day one was that your DiSC style does not define you, and that qualities you may find difficult to work with can also be qualities you look for in a person." Cohort members tell us that the best things about the program are the opportunity to learn more about their individual styles and personalities, how to best work with those who have differing styles and personalities, getting to know other emerging leaders, and that they enjoy the adult-centered, interactive learning environment. Congratulations to our Fall 2018 Cohort Members for successfully completing the program! To support our members in developing leaders who will help take their organizations into the future, LeadingAge Maryland is pleased to offer a newly redesigned Emerging Leaders Program. Helping high potential employees and new managers gain the knowledge and skills to contribute as effective leaders is a key initiative for any successful organization. As the healthcare environment changes and organizations are asked to do more with less, it will be more important than ever for not-for-profit aging services organizations to have effective leaders across all departments and levels. 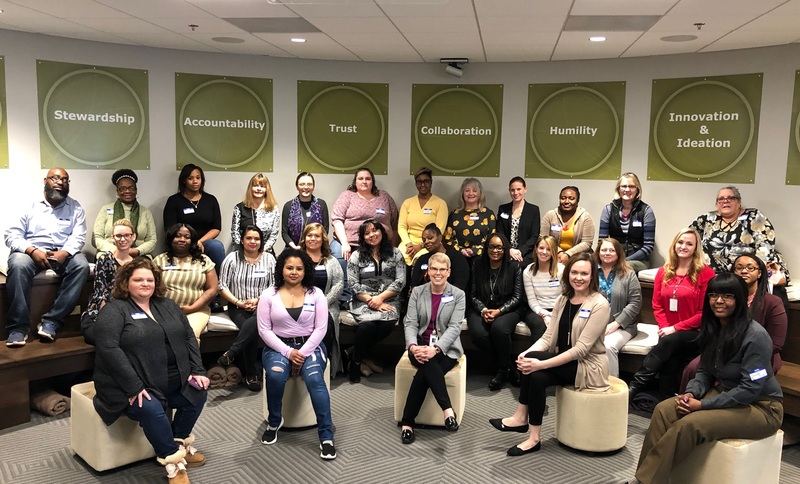 This program was developed based on feedback from LeadingAge Maryland members, past program participants, and input from subject matter experts in the fields of leadership and organizational development. Emerging Leaders is designed for individuals at any level of an organization who are newly in a management role, aspire to be in a management role, or who play or want to play a leadership role within their organization. Emerging Leaders is a selective, four-month long growth and development experience for individuals at any level of an organization who are passionate about the field of aging services, and who are seeking to transform themselves, their relationships, and their organizations. Expanding possibilities for aging through helping organizations develop engaged, whole, and effective leaders across every department and level. Participants will engage in small group, customized learning experiences over the course of four months. This is a highly interactive program that will prompt and facilitate self-exploration, discovery of strengths and areas of opportunity, and development of a plan for continued personal growth and development. Upon successful completion of the program, Participants will receive an official certificate of completion, along with recognition on the LeadingAge Maryland website, future Emerging Leader’s materials, and at the following year’s Annual Conference.